"Great staff, Very clean Rooms!" "The most comfortable beds ever"
"Small rooms, expensive to park"
While it was a fairly tight room the amazing comfort of the beds made that small bathroom insignificant. There was also a great deep tub that was just what I needed after lots of walking. Perfect place to stay for all the important sights Trolley stops in front and goes right down to Fisherman's Wharf for great food and Terrific views, Lori's Diner is a few doors away with great food, Walgreens on the corner. It was a very nice family hotel with an interesting history. Well located right off Union Square. The hotel staff were all very nice. Though we didn't take advantage of them, the bar and restaurant both seemed nice. The weather was cool and the hotel had the boiler running. Our room must have been 80 degrees and no way to shut the heat off. We were on the top floor and the hotel staff offered to move us to a lower (cooler) room. The second floor room was just as warm. The rooms really need local control of temperature. Rooms are just too small especially for price. Nice historic hotel in a great location. Friendly and informative staff. Room was small but we got one of the rooms on the top floor and the ceiling was about 15 feet high. It made the room seem much larger. There is no A/C in the room but it was comfortable with the ceiling fan and the window open. I liked hearing the sounds of the city in the evening. The city "noise" did quiet down during the night and had no problems sleeping. This hotel was recommended to me by my boss. He stays there every year for a reunion with college friends. I have not problem passing on the recommendation. Bedroom was clean, furniture appeared recent. Location was reasonably convenient. Room was claustrophobic - barely room to walk around bed. Paint was fresh, but clearly covering 100 years of obvious wear. Musty smell. No air conditioning - couldn't get room quite cool/dry enough to be comfortable. Bathroom was dingy, marked up and had seen better days, and it was hard to squeeze into toilet between sink and wall, even then, wedged in by shoulder-level toilet paper dispenser. Plumbing noises from adjacent units were loud. Weirdly shaped closet with mismatched hangars that were falling apart. The staff was great. They were very friendly and helpful. The location was also fantastic and the noon check out gave us a little additional time to explore the city without worrying about our bags. I would definitely recommend. Last minute booking. Great price! Pretty extraordinary. Prime location! Had a great time at the chancellor! Reasonably priced, friendly and accommodating staff, coffee/tea available 24/7. Great wifi, mini fridge in room. Great water pressure. They updated all the right things. Coffee maker/microwave in room would have been an improvement, but not a sticking point. The service at Luques can be slow, but the food is good. Great location, good price, comfortable, professional, courteous staff. We had a room on the top floor, which was clean and quiet, with a ceiling fan rather than AC. Despite typically being a light sleeper, and expecting issues with street noise, I slept better there than I have anywhere in years, not really sure why (could have been the 12+ miles walking each day in wonderful San Francisco). The hotel is in Union Square, with its incredible shopping and conference centers. Chinatown is about .5 miles away (and a very steep hill), and Fisherman's Wharf about 1.5 miles; a fun walk if you're up for it (but Uber is fast an inexpensive, especially the pool option). If you're looking for a plush, modern American experience, this isn't it. If you're looking for an affordable, comfortable, centralized location to explore SF, or attend a business conference, this is a great choice. Rooms are small, no air-conditioning (though not really needed) and there was no real work surface for a notebook. Not a place to get work done. Bathroom was dated, but functional. There's no fitness center in the hotel but you get free use of a health club around the corner with lots of good gear and yoga classes, which were great. There's no coffee in the room, but there's a 24 hour a day brew available in the lobby with cookies I found impossible to resist. Wi-fi is free and fast. Everything was clean and comfortable. The staff was kind and attentive. Location was perfect. Concierge was helpful. Absolutely would stay here again when visiting San Francisco. Breakfast wasn't included, but actually was delicious in the cafe downstairs. Great value! Great coffee/tea/water and they extended our checkout by 2 hours to accommodate our plans. Very nice. And BOGO cocktails for a night! Room is small but doable (without children). Built for the Panama Pacific International Exposition of 1915, San Francisco Hotels’ Chancellor Hotel on Union Square stood as the tallest building in the city. 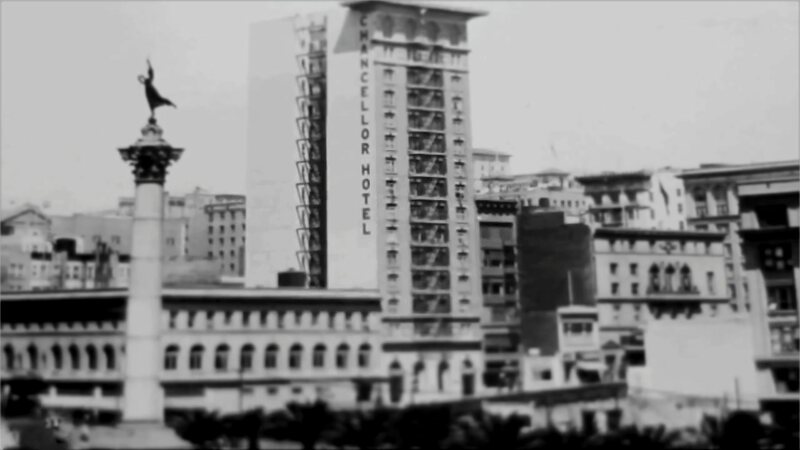 With the memory of the great earthquake of 1906 still fresh, the original contractor went broke designing the hotel to withstand even the strongest quakes. When Isador Rosenberg swooped in and saved it from abandonment, the hotel was turned into a family-owned and operated business and a staple of Union Square. The Chancellor Hotel features 137 luxurious and historic rooms and two suites. Contemporary decor and lavish furnishings provide ample comfort and are paired with a 32” flat-screen TV, free HBO, mini-fridge, in-room safe, and an over-sized bathtub. Each boutique room is sized to fit two people comfortably and is cooled by San Francisco’s fresh air and a ceiling fan. Hotel guests will wake up to a multi-station American Breakfast Buffet stocked with all one could want in the morning. Eggs, bacon, sausage, bread and pastries, and a pancake maker are filling fare before trekking out to explore sunny San Francisco. Travelers are steps away from San Francisco’s Union Square and the district’s renowned shops, eateries, art galleries, nightclubs, and lounges. Historic sites like Alcatraz Island and the Golden Gate Bridge are within reach, as is the city’s cable car system, Chinatown, North Beach, and Yerba Buena Gardens. A historic staple of Union Square, The Chancellor Hotel is an iconic piece of San Francisco that provides guests with maximum comfort and convenience. Built for the Panama Pacific International Exposition of 1915, San Francisco Hotels’ Chancellor Hotel on Union Square stood as the tallest building in the city. With the memory of the great earthquake of 1906 still fresh, the original contractor went broke designing the hotel to withstand even the strongest quakes. Search for Chancellor Hotel On Union Square discounts in San Francisco with KAYAK. Search for the cheapest hotel deal for Chancellor Hotel On Union Square in San Francisco. KAYAK searches hundreds of travel sites to help you find and book the hotel deal at Chancellor Hotel On Union Square that suits you best. $179 per night (Latest starting price for this hotel) - Save up to 25%.